Disney's FROZEN is the fulfillment of a promise made since the very early days of the studio, when animators put pen to paper and created magic. From Snow White, to Sleeping Beauty, to Ariel, Mulan, and Belle, these characters endure and are beloved, but none of them quite have what FROZEN's Anna (Kristen Bell) and Elsa (Idina Menzel) have - a self-sufficency and a spirit that goes beyond the normal tropes to create something wonderful for an entire new generation of little girls and women alike. These characters breathe, and create their own destinies, not relying on an overbearing parent to hold them back, or some Prince Charming to come and rescue them. For Elsa and Anna, happily ever after is something worked for, not something given. If this is the direction that Disney is taking, then I'm all for it. We haven't had a great animated musical since, well, BEAUTY AND THE BEAST. And while Pixar does what they do, Disney Animation has struggled to keep up, either trying to stoke those same fires or simply playing to the lowest common denominator. Sure, WRECK-IT RALPH was an exception, but Disney Animation has in recent years always seemed to be within Pixar's shadow. With FROZEN, they are in the glorious light once more, bringing back the animated musical in a huge way. FROZEN is what Disney Animation should be making - something that sparks the imagination like those great Disney classics of old. Elsa and Anna are sisters, princesses in the kingdom of Arendelle. Elsa is the older, and born with magic powers, powers that give her the ability to freeze and make snow and ice, but during a childhood play session, Elsa accidentally hits Anna with her powers, almost killing her. The King and Queen of Arendelle decide to keep Elsa and Anna separate for Anna's own protection, and when the King and Queen are lost at sea, they are kept separate until Elsa's coronation. Anna misses her sister terribly, and doesn't know why Elsa shuts her out. Anna needs a bit of guidance herself - she's a bit flighty, and when she announces her engagement to Hans (Santino Fontana), a man she only just met on Coronation Day, Elsa forbids the wedding. Her powers manifest in her anger, causing Arendelle to undergo a neverending winter, and Elsa must flee the Kingdom. 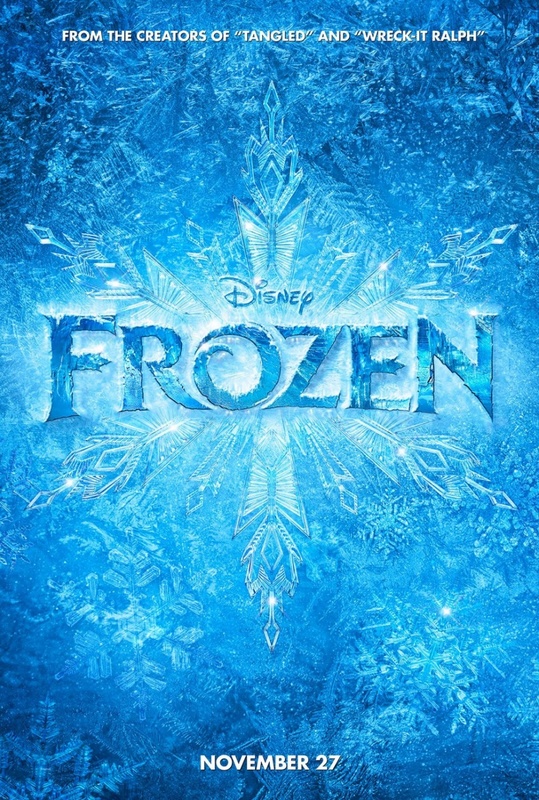 Anna takes it upon herself, with the help of ice merchant Kristoff (Jonathan Groff) to find Elsa and bring her back, to somehow end the winter and save the Kingdom fro the clutches of its enemies. The songs, by Kristen Anderson-Lopez and Robert Lopez, are magnificent. Not since the days of Howard Ashman and Alan Menken has a Disney musical had such great songs, that inform the story as well as bring passion and wonder to the film. It also helps that FROZEN has such great singers like Idina Menzel, whose showstopper "Let It Go" joins such great Disney anthems as "Be Our Guest" and "Part Of Your World" that will live long in the hearts of children everywhere. Menzel's duet with Kristen Bell, "For The First Time In Forever," has special yearning and beauty. But FROZEN also gets playful, as when Josh Gad's Olaf the Snowman, a magical creation of Elsa's, sings, "In Summer," as he imagines what it would be like to live in that blissful season (and oblivious to what summer does to snow), or when Jonathan Groff's Kristoff duets with his reindeer Sven (and singing with Sven's voice) on "Reindeer(s) Are Better Than People." The music would be incidental if the story wasn't as effective. But FROZEN, very loosely based on Hans Christian Andersen's THE SNOW QUEEN, has characters that feel unlike other Disney characters in that they do not feel bound by their past. They feel new, and strong in ways that Disney characters have never quite been before. There's something beautiful about the relationship between Anna and Elsa, a sisterhood that feels real, full of love, even when they do not get along - brave and full of passion. All the characters are well-rounded, including the men. Jonathan Groff's Kristoff is heroic, but he's not the hero. Olaf the Snowman may be comic relief, but he also has dignity and a joy about him that is infectious. Even characters like Hans and Alan Tudyk's Duke have many facets to their personalities, and aren't simple caricatures. But Elsa and Anna are Disney Princesses for the ages. They aren't mere role models, but strong women who take control of their destinies, and don't need the handsome prince to save them. These women save themselves, and with more than simple ability, but with intelligence, soul, and a determination that the world will not defeat them. They will find their place in the world, and live a life without regret. Disney's marketing so far has been somewhat disastrous - as if they're afraid to sell the movie that they've made, so they market it as being full of funny animals, pratfalls, and Olaf (who, to be fair, is adorable, and Josh Gad is terrific). But don't let that dissuade you. FROZEN is a return to that wonderful Disney musical tradition, dormant for a few years, but returning with the fury of a winter blizzard. These are the movies that Disney Animation needs to be making, not trivial movies like CHICKEN LITTLE or MARS NEEDS MOMS, but a return to the days of Howard Ashman, Alan Menken, the Sherman Brothers, Frank Churchill and Larry Morey, Leigh Harline and Ned Washington, Peggy Lee... the list goes on. FROZEN is magical in the best Disney tradition, and the best American animated film of the year.